I love Asian cuisine! I think I can happily devour Asian food every day of my life. For a while, I got addicted to Malaysia's Nasi Lemak and Laksa. There was a time when all I could ever think about was Pho. 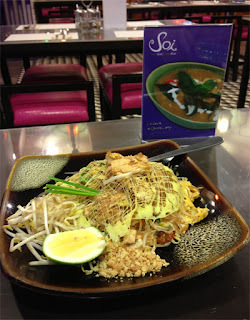 Now, I'm currently obsessed with Pad Thai. Thai is definitely one of my favorite cuisines. The decision to get Soi vouchers from Metrodeal was a no-brainer for me since each voucher cost Php 650 pesos for Php1000 worth of delicious Thai food. That's 35 % savings! 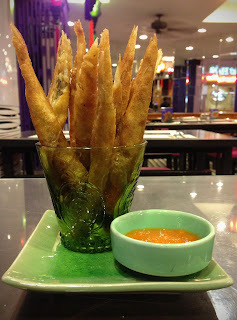 I had the pleasure of eating at Soi (Robinsons Manila) before but I never had the chance to go back again.. 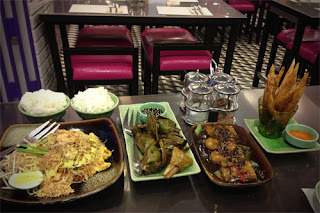 I am thankful to Metrodeal because I got the chance to try Soi's branch in Alabang Town Center. It's easy to use Metrodeal vouchers. Before leaving the house, I printed the voucher. Upon arrival at the restaurant, I gave the staff my name and showed my voucher. They ushered me and my companion to our seat. Before we even ordered, they gave us free peanuts and chips! We ordered a lot of food. For our appetizer, we got Fried Spring Rolls. We also ordered Chicken Pad Thai, Chicken Pandan, Thai Sweet and Sour Fish Fillet and 2 cups of Jasmine Rice. I read rave reviews about their Lemon Grass Juice so we got that as well. We loved everything especially the Chicken Pandan! We really couldn't finish everything so we requested the friendly staff to bag our food. I'm definitely going back there. Thanks Soi! Thanks Metrodeal!